Halfway between Rhodes and Nusyros, Tilos is a small island of the Dodecanese archipelago who experienced several dominations over the centuries. Once populated and rich, after the Secon World War (during which, German troops decimated all the cattle of the island), today the island has just little more than 300 inhabitants, divided between the only two inhabited villages. Its origin is uncertain. Probably, it was linked to Asia Minor and inhabited by elephants in the Neolithic period. When, about 10,000 years ago, the island broke off and went off to sea, elephants got smaller and some remains of this "new" species are preserved in the museum of Megalo Chorio still today. Later, it was dominated by Byzantines, Romans, Ottomans, the Knights of St. Jean's Order, Italians and Germans. Only in 1948, it was reunited with Greece. In the past, it often felt prey to pirates: this is why its inhabitants have almost never fished and they preferred agriculture and farming. Today, Tilos is a pearl nestled in a wonderful sea; it's not a typical tourist destination, so don't expect great hotels and services, but choose it just to relax. 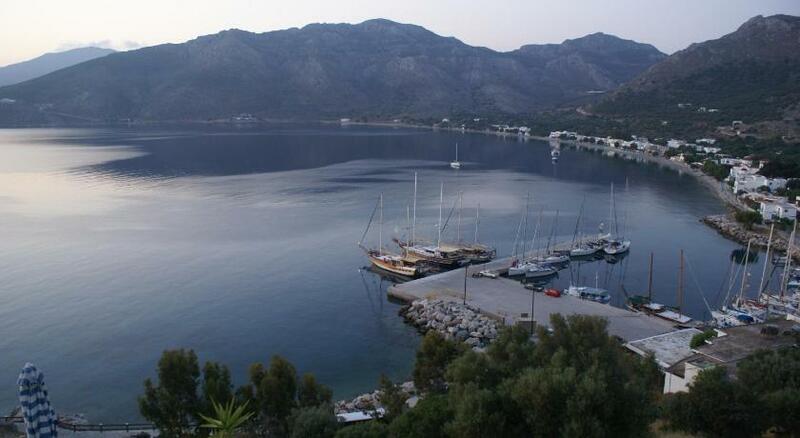 Getting here is not difficult and you can moor in the small harbour of Livadia, located inside a large bay on the south-eastern coast of the island. The only hardships could be represented by south-eastern winds and the waves generated by tourist ferries. For the rest, the harbour is well-sheltered from all winds and provided with a large quay. The harbour offers 15 mooring places, each provided with mooring ropes. The sea bottom is sandy and rocky, with a good grip. The only flaw is depth, which can even reach 1 metres in some areas. As an alternative, you can moor inside the dock, where depth is about 6-7 metres, but only when there are no ferries. As regards services, the quay offers drinkable water, electricity, video-surveillance, while some taverns, coffee bars, minimarkets and a gas station are in the surroundings. The harbour is very crowded in summer, especially in July and August. If you don't find a place, you can drop the anchor in the large bay which hosts the harbour or in Eristos Bay, on the north-western part of the southern coast (well--sheltered from northern winds), and Agios Antonios Bay, on the north-western edge.